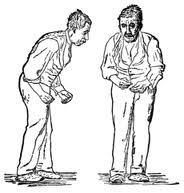 Diagnosing Parkinson's Disease (a degenerative neurological disorder) is hard, usually a clinical exam and assessment of symptoms by a neurologist with at best about an 80% accuracy rate. There is no "test" per se that can diagnose Parkinson's Disease... until now. In patients with Parkinson's Disease, an uniquely abnormal protein called alpha-synuclein protein can be found in the submandibular spit gland located under the jawline. By obtaining a tissue biopsy of the submandibular gland, an actual histo-pathological diagnosis for Parkinson's Disease can be made, even in the early stages when the clinical diagnosis of Parkinson's Disease may still be unclear. Per studies (see below), the accuracy can reach 90% sensitivity and specificity. • Permanent lip paralysis as the nerve that goes to the lower lip is located right over this gland. • Permanent tongue paralysis as the nerve that moves the tongue is located right under this gland. • Permanent numbness of the mouth floor as the nerve that provides sensation in this location is also located right under the gland. Studies have also been performed using ultrasound guided core needle biopsies in order to avoid the risks associated with open tissue biopsy of the submandibular gland. The accuracy is not as good with needle biopsy at around 70% sensitivity and specificity, but still worth pursuing when taking into consideration risks of open biopsy. Minor salivary gland biopsy (for example, lower lip biopsy for Sjogren's disease) was also looked at in one study and found this method to be inaccurate and not advisable to diagnose Parkinson's Disease. Submandibular gland biopsy for the diagnosis of Parkinson disease. J Neuropathol Exp Neurol. 2013 Feb;72(2):130-6. doi: 10.1097/NEN.0b013e3182805c72. Diagnostic value of minor salivary glands biopsy for the detection of Lewy pathology. Neurosci Lett. 2013 Sep 13;551:62-4. doi: 10.1016/j.neulet.2013.07.016. Epub 2013 Jul 21. Submandibular gland needle biopsy for the diagnosis of Parkinson disease. Neurology. 2014 Mar 11;82(10):858-64. doi: 10.1212/WNL.0000000000000204. Epub 2014 Feb 5. Alpha-synuclein in peripheral tissues and body fluids as a biomarker for Parkinson's disease - a systematic review. Acta Neurol Scand. 2014 Aug;130(2):59-72. doi: 10.1111/ane.12247. Epub 2014 Apr 5. Prevalence of Submandibular Gland Synucleinopathy in Parkinson's Disease, Dementia with Lewy Bodies and other Lewy Body Disorders. J Parkinsons Dis. 2016;6(1):153-63. doi: 10.3233/JPD-150680. Peripheral Synucleinopathy in Early Parkinson's Disease: Submandibular Gland Needle Biopsy Findings. Mov Disord. 2016 Feb;31(2):250-6. doi: 10.1002/mds.26476. Epub 2016 Jan 22.